This edition is a set of two parts, each sold separately. Juan Bautista Comes (ca. 1582–1643), famed for his polychoral devotional and liturgical compositions, held positions in Valencia and Lerida. 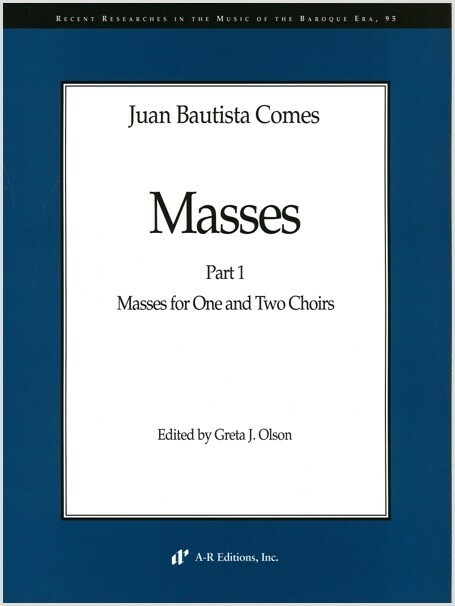 Although he may have written as many as eight Masses, this edition presents the extant complete masses by Comes for one, two, and three choirs. Included in this edition are his Misa Exsultet caelum, Misa Iste confessor, Misa que fertil que es el ano, Misa ad instar praelii constructa, and the Misa de tres contrabajos. These works demonstrate changes in texture, harmony, and borrowed materials, which are representative of both Comes and his Iberian contemporaries. In these Masses, Comes handles the pacing, balance, motivic plasticity, and varied sound color deftly and, at times, dramatically.